The second presidential debate was, as anticipated, one heck of a show. It's being referred to as one of the darkest presidential debates of all time, and between the boundary-breaking insults, threats, and interruptions from Donald Trump, it's miraculous that we got through the 90-minute debate at all. But in the midst of all that chaos, there was a beacon of optimism which came from Ken Bone, a town hall participant who was decked in an eye-catching red sweater and equipped with a disposable camera. And if you want to dress like Ken Bone for Halloween, there are a number of websites that are giving some outlines on how to gear up in his full regalia. Just in case you missed it, Bone was the town hall audience member who reeled the runaway train debate back to some serious domestic issues — namely, climate change and energy policy. And his question has catapulted him to fame, with many calling him a hero. “What steps will your energy policy take to meet our energy needs while at the same time remaining environmentally friendly and minimizing job loss for fossil power plant workers?” Bone asked the presidential candidates. Trump, who has said climate change was "a hoax" and has outlined an energy policy which seems to rely on oil drilling, responded by saying he is "for all alternative forms of energy, including wind and solar," while advocating "clean coal" in the US. Clinton talked about clean, renewable energy and natural gas, and denounced Trump's alleged use of steel that China is "dumping" into the U.S. So Bone's question prompted a bit of serious discussion — and some people want to celebrate his brave question by dressing up as him. Tweets about Bone have referred to him as having a "calming demeanor," being huggable, and being "a hero." And if you want to rock his look for the upcoming end-of-October holiday, here are a few quick and easy steps. 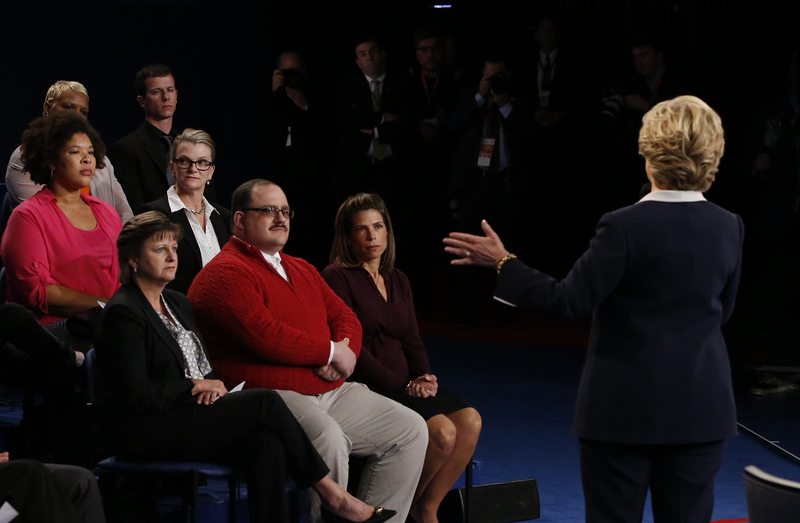 First and foremost, you gotta rock the red sweater the way Bone did during that tense debate. "It's more famous than me. I just had to bring myself along," Bone quipped when interviewed on CNN earlier Monday, talking about how he and his sweater had become an internet sensation. So don't think of this sweater as one of those "Christmas sweaters," but rather an awesome and vibrant sweater befitting of a civil hero or debate champion. GQ tweeted that the IZOD Men's Cable Solid 1/4 Zip Sweater is listed between $42 and $63. However, Bone made it so popular that the sweater is currently sold out. But it may be available on Amazon. If you want to add a bit more of a feminine twist to the sweater, you can try sporting the Ralph Lauren Women's Red Gold Zipper Sweater. You've also have to be able to wear that adorable down-curled dark mustache. A Twitter post compared Bone's mustache to that of Al, the crazy toy collector who steals Woody in Toy Story 2, but you don't have to go that far in your characterization. A toy imitation of this 'stache would work, but you can also channel your inner Theodore Roosevelt with the Candy Apple Costume website, which sells Deluxe Character Mustaches. The mustaches go well with a magician, ring master, or a Victorian man costume. You just can't pull off this costume without those black-rimmed glasses. Believe it or not, people are really into having the full Bone look, and according to one Twitter post, a Sear's Optical Ken-Bone-styled pair of glasses just sold out. But not to worry. A pair of fake "nerdy" glasses will suffice! And you can get them for under $3 from Amazon Fashion. It was the vehicle that allowed Bone to cut through the tense and nail-biting debate to tackle the question of energy sustainability and the preservation of fuel-related jobs. And you can grab a toy microphone on Amazon for just $6.00. But they were all the rage 20 years ago, and they still are sold in a number of convenience stores and supermarkets. And odds are a number of your childhood pictures were taken with them. Best part of the Kodak disposable camera: It actually takes pictures, so you can capture the festivities and the reactions to your Bone costume in full force without losing character! You can order a three-pack on Amazon for $23. Last but not least is the white tie. If you have one is stock, perfect. If not, you can grab one on eBay for $2! You can grab a solid white tie from Cheap Neckties for just $5. He's being called a "debate winner" by CNN and various other news outlets for keeping his cool when asking a question about such a dire and important topic in such a high-profile and frenetic moment. Affable, unassuming, yet confident enough to be true to his character and convictions, this costume calls for some patriotic and "American as apple pie" vibes, with a touch of showmanship. Just goes to show that sometimes its the unique person who is able to take the world by storm.